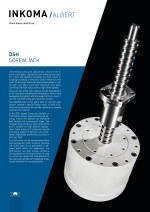 A classic spindle screw jack consists of one or several worm gears, that as a rule are driven by one drive motor. As a result very long drive trains can develop, which lead to greater mechanical losses when only one motor is used. For particular applications with high clock frequencies in combination with a high duty cycle conventional screw jacks using worm- or bevel-gear units are often pushed to their limits. Those are two of many reasons for the development of a completely new screw jack system. Following extensive preliminary investigations with the involvement of technical universities our new direct spindle screw jack (DSH) was developed. INKOMA-DSH screw jacks work without a separate gear unit. A ball screw is integrated directly in a torque motor. Consequently the ball screw drive is driven directly and without play by the motor. As a result almost no mechanical losses develop in the complete DSH system. Pull- and push forces of the spindle are absorbed via corresponding axial bearings. The compact drive system is distinguished through a high degree of rigidity and is therefore suitable for highly dynamic applications. Lift clock frequencies in the Hertz range can be achieved at travel speeds from standard up to 32 m/min. Thereby the positioning- and repeat accuracy is in the micrometer range. Multiple drives working together do not need to be placed in one plane. Nevertheless they work exactly synchronously with each other.